The poll elicited the following observations and comments from Edson L. Tennyson, a renowned transportation engineer and consultant to the Light Rail Now Project. Ed is widely respected within the North American public transportation industry, having served as manager of several major transit agencies as well as Transportation Engineer for the City of Philadelphia and Deputy Director of Transportation for the State of Pennsylvania. Without facts the people responding to that poll do not know what they are talking about. Since King Street is in the Old City, what business is it of Scarborough? Let us look at the facts. A lane of autos waiting at traffic signals can move only 900 passengers per hour, not enough to keep a city busy or healthy. I do not know the streetcar headway, but with 56,700 weekday passengers, it sounds like 4,500 one-way in the peak hour, 5 times auto capacity. With 90 people per 4-axle car, that would require a 1.2-minute headway, 50 cars per hour. With articulated cars, a 1.8-minute headway could handle it. The point is, who wants to allow 900 [Mayor Rob] Ford supporters to block the movement of 4,500 people per hour? Polls will not move anyone, but those 800 automobiles with 900 people will block 4,500. That is stupid, uneconomical, and grossly unproductive. When gridlock gets bad, transit speed falls to three (3) miles per hour. A streetcar costing $235 per hour will cost $78 per mile at three miles per hour; but at 6 miles per hour, which might be possible with no autos, the streetcar cost falls to $39 per mile, a saving of 50 percent for farepayers and taxpayers. If the media had the integrity and equity to explain it that way, I am sure the polls would change drastically in favor of streetcars. Crooked politicians like Mayor Ford were running the U.S. Congress in 1959 when they banned streetcars from the District of Columbia [i.e., Washington, DC]. They did it to speed auto travel, but it did not work that way. It sped auto travel, all right — away from the city instead if into it. Back then, Washington’s streetcars were almost as busy as Toronto’s streetcars. They made a profit to subsidize bus service, but they annoyed motorists. Traffic engineers wanted the streetcar lanes for auto left turns, a very low-volume use. Traffic engineers were trained at the Eno Foundation, then subsidized by General Motors. 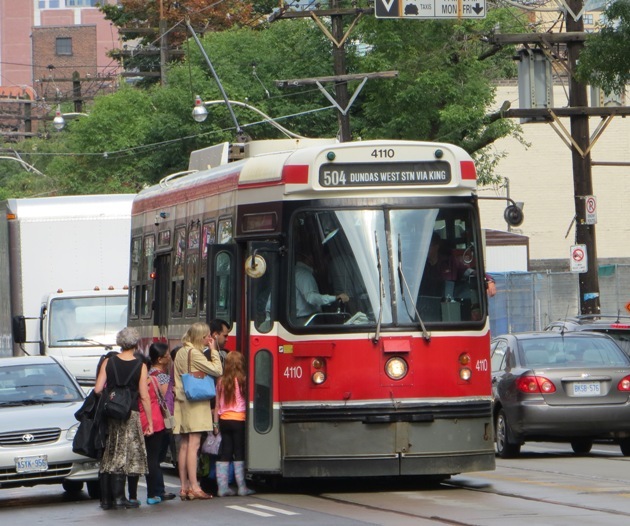 They were required to teach the need to eliminate streetcars. most riders. Many downtown department stores went out of business. People with good jobs moved out of the city to escape auto congestion caused by automobiles, not streetcars. From 1948 to 1975, transit use in Washington fell by 72%. The population fell from 750,000 to 590,000. By 1990 the City had so much debt it could not function. Congress had to bail it out, castrating City Council. city has too much money. The population is growing with higher-income people. When MetroRail was planned they took a close look at Toronto to get it right. They did. Simulation of Providence streetcars serving downtown crowds at night. Source: City of Providence. 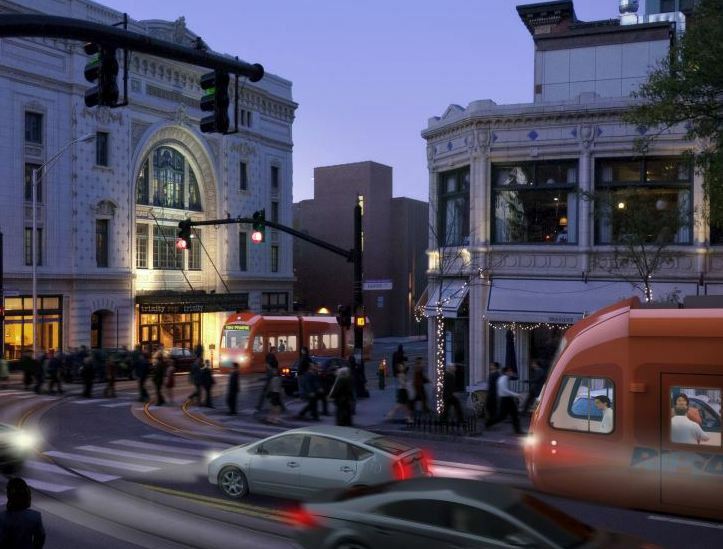 Providence, Rhode Island — This mid-sized New England city is ready to install a new streetcar system. All it needs is some federal cash. 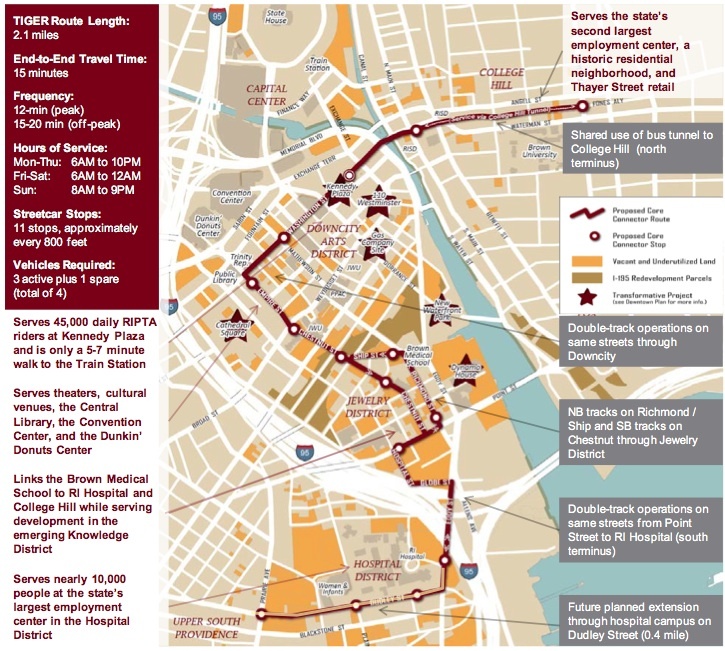 According to a recent report from WPRI-TV News in Rhode Island’s capital city, local and federal officials are asking the federal government for $39 million to help pay for about a third of the cost of constructing a new streetcar line to connect the Upper South Providence neighborhood near Rhode Island Hospital to College Hill on the downtown’s East Side. (Click to enlarge) Source: City of Providence. The 2.1-mile, $114.4-million starter line would have 11 station-stops and 4 streetcars. The federal money would come from the Transportation Investment Generating Economic Recovery (TIGER) grant program, a component of the Obama administration’s original 2009 economic stimulus package. The rest of the project would be paid for with an array of city and state bonds as well about $5.25 million in additional federal funds secured by the Rhode Island Public Transit Authority. Sponsorships, advertising revenues and $2 fares would be used to sustain the system once it got up and running. Once the project gets a green light, construction would begin by late 2015 and streetcar service would open to the public in 2017. Philadelphia — With an opulent reception and major flourish, on the evening of June 3rd during the annual Rail Conference of the American Public Transportation Association (APTA), the third of the “Big Three” global rail transit car producers announced its entry into the North American light rail transit (LRT) rolling stock market. Alstom’s move is not only a major step for Alstom, and for the North American LRT car market, but also a de facto testament to the vigorous growth — and strong potential growth — of LRT across North America. The two other “Big Three” producers — Siemens and Bombardier — have been major supplliers for the transit railcar market, [articularly in the USA and Canada, and a number of other firms, both foreign and domestic (e.g., Kinkisharyo, Breda, Kawasaki, Rotem, Skoda, Inekon, Brookville Equipment Corporation, Oregon Iron Works), have also been important players in the industry. Those features include a 100% low floor design and the ability to operate at speeds of up to 65 mph. Hence, the Citadis Spirit is versatile and can provide both a streetcar service in mixed traffic as well as a commuter service on dedicated infrastructure. Its low-floor boarding and interior, which is free of steps, provides better accessibility as well as a safer and more comfortable ride to users of all walks and ages. The vehicle also is totally modular in length and can be expanded as a city’s transportation needs grow over time. Additionally, the Citadis Spirit can be paired with one of Alstom’s proven off-wire power supply systems to preserve historic cityscapes and minimize impacts on the environment. 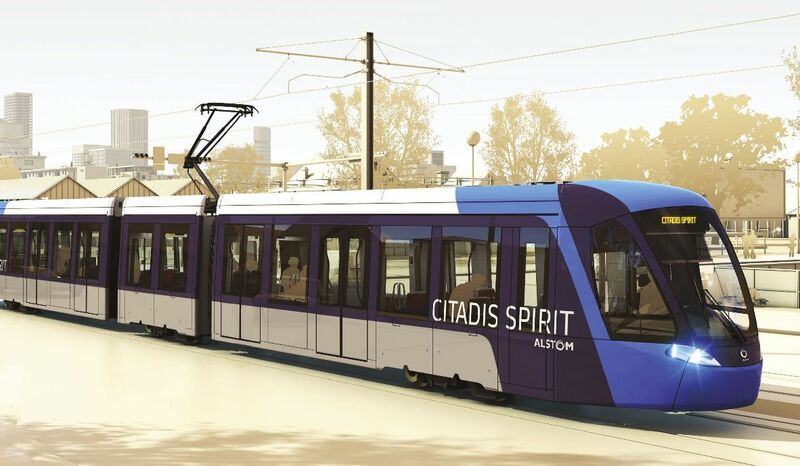 Alstom has already secured a major contract for the Citadis Spirit. 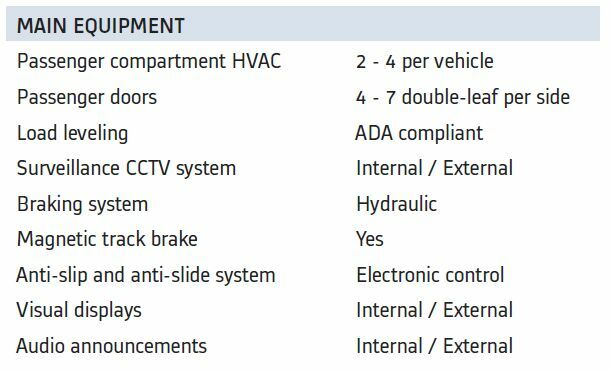 In February, the company announced its first order — from the City of Ottawa for its new LRT system — with a contract to deliver 34 cars, plus an option for an additional 21 cars, and 30 years of maintenance services. The car for Ottawa will be a high-capacity version of the Spirit with a total length of 160 feet. As of 2015, says Alstom, the Citadis Spirit will be manufactured in North America . Its design and manufacturing process are very modular and flexible, allowing final assembly to be localized close to end-users and municipalities. in developing the Citadis Spirit, we recognized that every city has a unique ambition for public transportation and an expectation that our mobility solutions boost sustainable economic development. 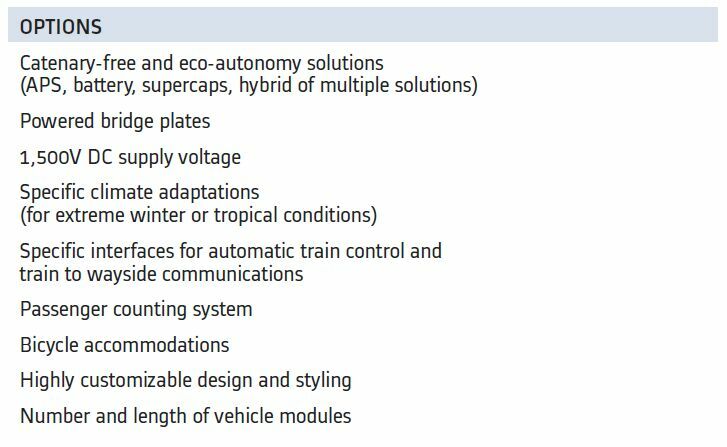 With this vehicle’s versatility and modularity, Alstom is able to respond to those expectations as they evolve over time. Our Design & Styling department can also customize the train’s interior and exterior design to embody each city’s unique character. Each new Citadis Spirit will be shaped by and a reflection of the community it serves.